Butchers link sausage to make ends meat. Why didn't the lifeguard save the hippie? Because he was too far out, man. A train stops at a train station. A bus stops at a bus station. Now, why is my desk called a 'work station'? Internet and affiliate marketers are independent and students of online marketing, as are SBOs. They're constantly learning and then applying what they've learned into action. The tasks are many as you learn how to build a website,and you learn how to do online marketing. You learn that you must constantly promote. As a marketer you understand the complexity and the numerous online relevant tasks involved in internet marketing. Obviously, just starting out or even in the process of building a business, you can't afford to outsource-that is,quality outsource. There's always Fiverr, which I'm certainly not disparaging in any way, as the World-Wide membership brings unbelievable talent to the fore. What do you do, if you want to build on your own? You become your own blogger and copywriter for your enterprise. The good piece is that you can reflect your personality,and write value-add articles as long as time permits. You yourself must make it work. Often times for Telco,from which I retired,if you had a daunting and complex task in front of you, and you asks your manager what to do, the answer was "make it work!" So you're the business owner, the IMer, the blogger, the copywriter and you have to make it work. You can do a phenomenal job just by expressing yourself,with a bit of writing technique. Is rhetoric important? Yeah, it is, because it involves words, and you sway and convince with words. How in the world do you get an initial nod, so you can get increase responsiveness by easing into your proposals like conversions, signups, and referrals? When entertaining a prospect you start with something very small, after which you can advance to a more formal customer persuation. The initial nod is called "foot in the door" by experience marketers. 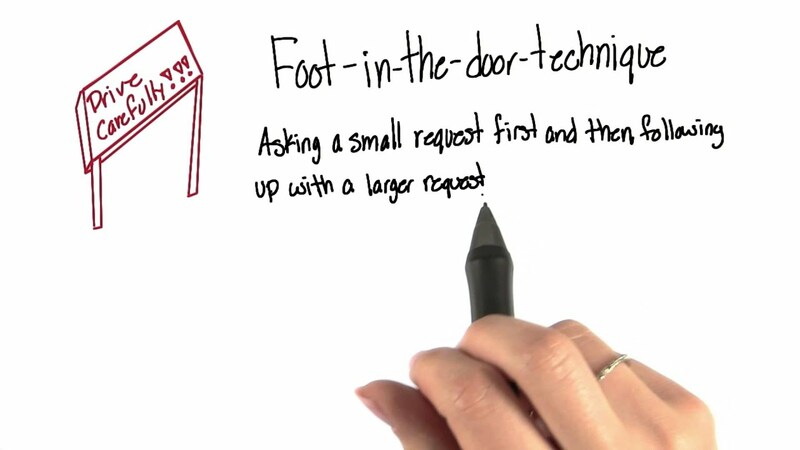 Foot-in-the-door technique is a compliance tactic that aims at getting a person to agree to a large request by having them agree to a modest request first. The principle involved is that a small agreement creates a bond between the requester and the requestee. Another approach "door in the face", is an approach from which you stay away. The door-in-the-face technique is a compliance method commonly studied in social psychology. The persuader attempts to convince the respondent to comply by making a large request that the respondent will most likely turn down, much like a metaphorical slamming of a door in the persuader's face. The smaller request,product or service is the one with which you really need to start. Is someone is a serious prospective buyer? You need to learn the subtle cues they’re giving you. To do that, you have to relax. You can't read the signs when anxious. If you're focused on what to say next you'll miss what is right in front of you. When you let go of that anxiety, your perspective will change.